Athlyn has shared her life with four parrots, written articles for avian publications, and helped owners address troubling parrot behaviors. A parrot should not be purchased simply because it has beautiful plumage and would make an interesting topic of conversation when visitors stop by. Parrots are intelligent creatures that need to do far more than merely sit in their cages and look pretty. Once a parrot has been brought into the home, consideration should be given as to how to meet its particular needs. Like their human counterparts, parrots feel a range of emotions. Parrots are capable of feeling frustration, boredom, and loneliness. Parrot toys can help to temper these emotions. A parrot has an innate need to chew and shred, to preen and to forage. Good toys for parrots provide opportunities for decision making, intellectual development, physical exercise, the release of aggression, nurturing instincts, and other role-playing behaviors. 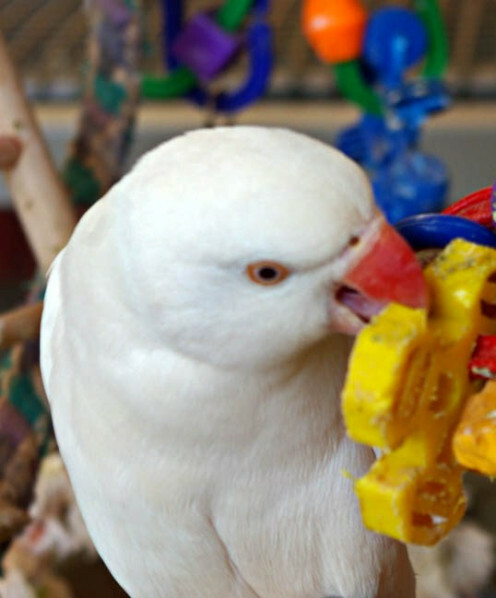 Toys can help to foster adjustment in parrots taken out of their natural environments. A bored bird can soon become a "bad" bird, displaying aggression, territorialism/over-bonding and turning to its own feathers. A parrot that has to spend time in its cage while owners are away can become easily frustrated. Not only is it isolated from its "flock" but it is also confined. 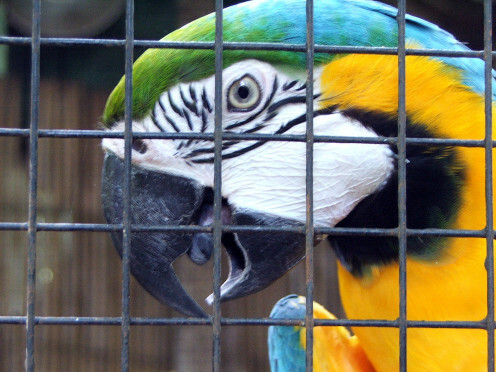 While a cage is a bird's territory and may be a safe haven for eating, bathing and sleeping, it can also become a prison if a bird has to spend long hours inside. 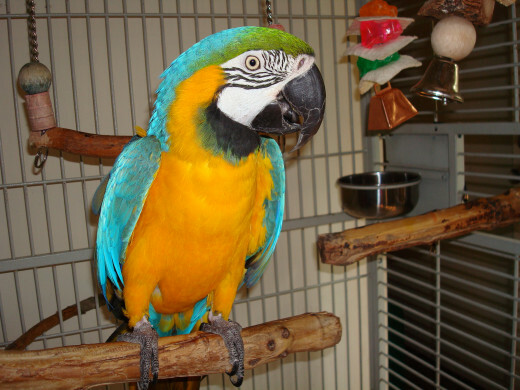 A conscientious owner will ensure that a pet parrot has plenty of one-on-one time and out-of-cage time but for those times when cage-time is necessary, providing a companion parrot with toys can help to make time spent in the cage somewhat easier. An untold number of parrots are surrendered each year to rescue organizations because their owners failed to provide for their needs. Parrots have a natural curiosity so playthings that offer an outlet for inquisitiveness are ideal. Parrots are "busy beakers" so It is important to give a parrot something to nibble on. Parrots deprived of toys may self-mutilate, turning to their own feathers as a means to relieve boredom. 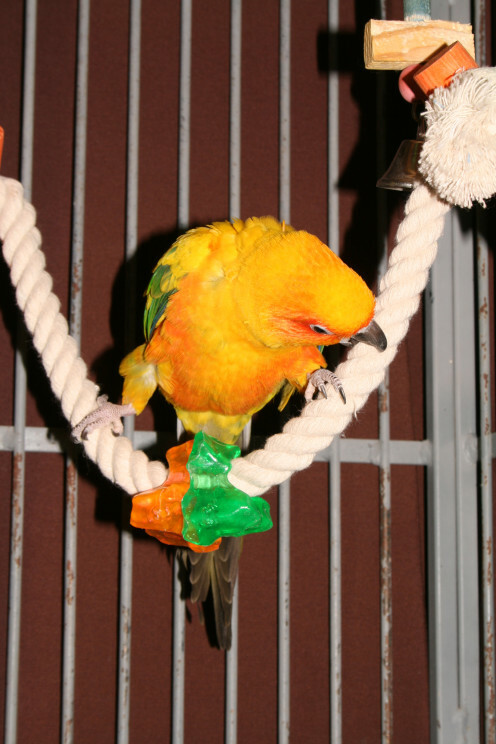 Many parrot chew toys are made of vegetable dyed wood and provide a safe outlet. Alternatively, an unsprayed branch can also make a good chewing toy. Make sure that branches are taken from trees that are safe for parrots and that trees haven't grown along a roadway. 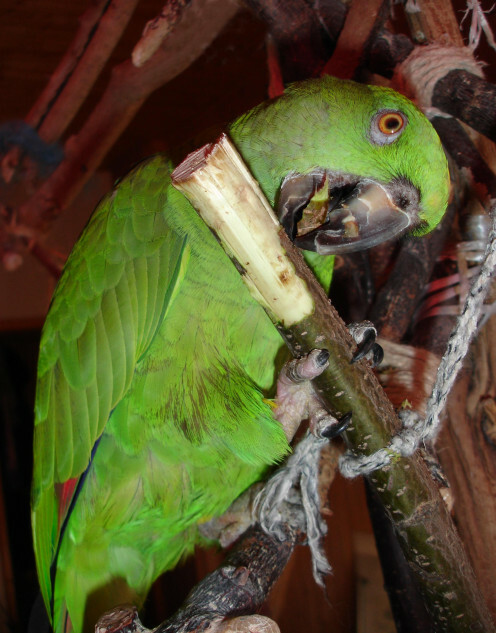 Why branches make ideal parrot toys is that parrots also like to strip off the bark. 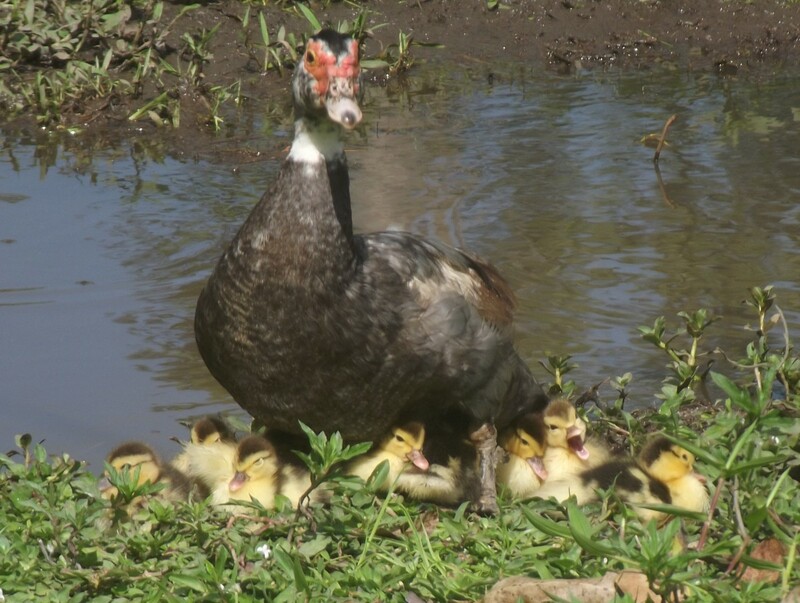 This gives them a "job" to complete, which is a close mirror to nest-building activity in the wild. A parrot will often strip off the bark first with great relish and then get to work on the rest of the wood, eventually chewing it into small pieces. Chewing activity helps parrots to keep their beaks in trim. A swing makes another excellent toy. A playful bird will figure out lickety-split how to get a swing rocking. In the wild, parrots hang and swing from branches, as part of their normal innate activity, so a swing can help a parrot feel right at home and allows for exercise. Swinging toys come in a variety of styles/materials. From actual swings to soft swing-style perches (pictured on right). A soft swing serves as perch, a swinging toy, and also a chewing toy. 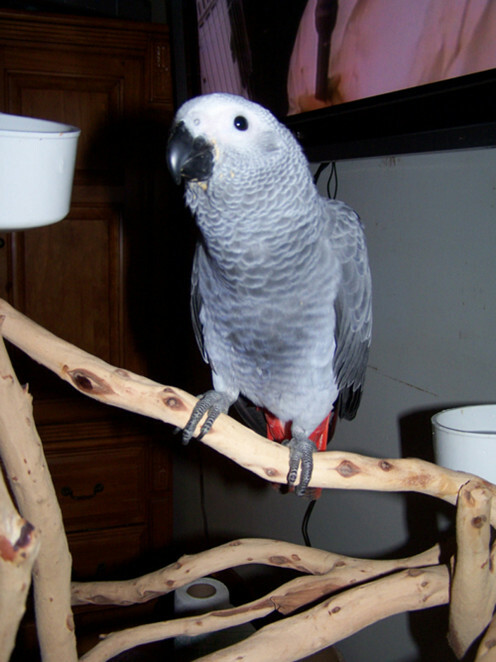 Soft Perch--it is a good idea to provide at least one soft perch for your parrots. Most wooden perches or dowels can be quite hard on a bird's feet. Metal cage tops are also unyielding. Take notice of where your bird spends most of its time and how much actual time it spends perched in its favorite spots. It is a good bet that your parrot spends hours on hard surfaces. 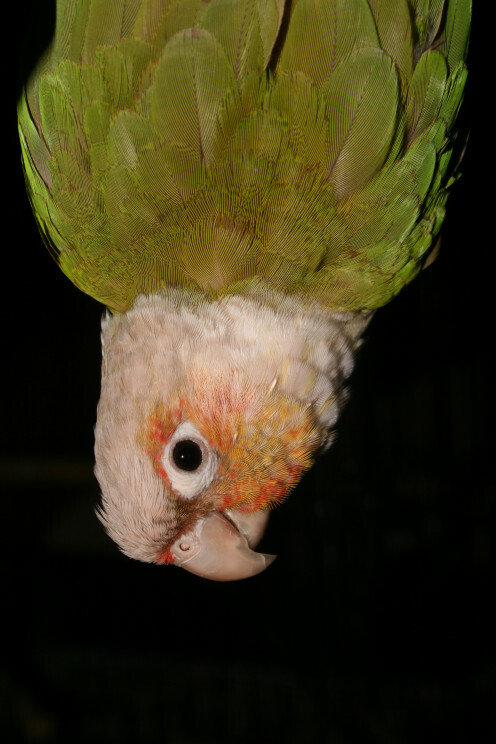 A soft perch can provide relief for your parrot's feet. Indeed, most parrot owners have noticed that a flighted bird will choose a softer place to perch, such as a padded chair back. 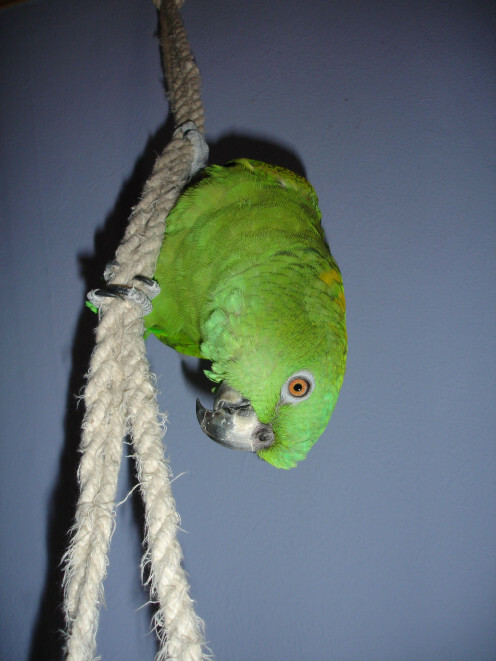 Swinging Toy--a rope perch or rope swing toy can provide hours of entertainment for a parrot. It is a close second to swaying branches that a bird would enjoy in the wild and because parrots are natural acrobats, this type of toy gives them plenty of opportunity to express their innate tendencies while having a work out. They will swing, flip their bodies in somersaults, hang upside down and dangle by one leg. Chew-Toy--It has been said that parrots are like young children in that they put everything into their mouths. A rope toy will also will get nibbled on. A parrot in the wild would spend much of its time flying. Exercise helps to keep a parrot physically and mentally healthy. Parrot toys that allow for climbing are ideal, helping a bird to release some of its restless energy. Olympic Rings (interlocking rings with a bell) encourage swinging activities. A knotted rope can also provide hours of entertainment. Parrot ladders make good climbing toys. While toys are never a substitute for one-on-one human companionship, playthings can help curb a bird's loneliness when its owners are absent. Some toys for parrots are actually designed for this purpose. Polly Dolly or Snuggle Buddy toys can serve as substitute companions. A parrot will in turn play with, preen, and even beat up companion-type toys, as a normal part of avian behavior. While not actual "toys," parrot play stands serve in this capacity and come in a variety of materials. These can be either purchased or made. Play Stands--a good play stand allows for climbing. Some are no more than glorified feeding stations. If a parrot owner decides to purchase a play stand, it is a good idea to shop around and find one that offers more than mere perching space. A good play stand offers a work-out and is designed to encourage play time. Tree Perches--some owners make tree perches. A tree perch costs nothing and if it has many branches it's ideal. A parrot can climb all over it, hang upside down and shred the bark. A parrot can also use a tree perch for daily wing flapping, which helps to satisfy the urge to fly. A variety of different-sized branches is better for a parrot's feet. Normally, smaller tree branches have "give," which makes for more comfortable perching spots for tender feet. 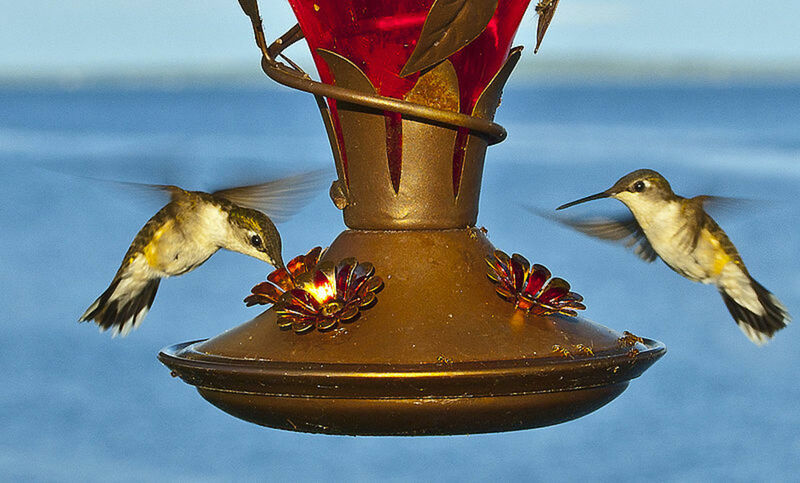 Commercial wood perches are made for durability but do not offer that same "springy" effect. Because of this, when choosing perching toys, choose a variety and consider the "give factor," making sure your parrot also has soft perches or rope perches. A comfortable bird is a happy bird. Bad Bird or Bad Owner? It has been said that there are no bad birds, only bad owners. While this may seem harsh, if you bring a parrot home to live with you, you must be fully prepared to provide an environment that best suits your bird's needs. A Word About Homemade Toys: Safety First! 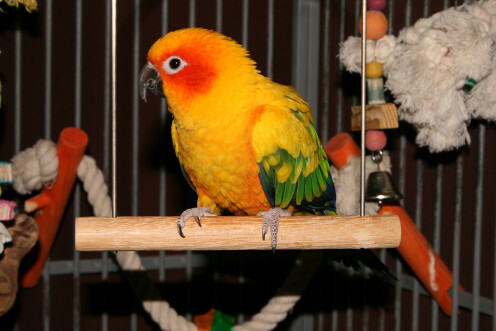 There are a number of items in the home that can be used as parrot toys but in all cases, consideration should be given to potential toxicity, via chemicals in materials; to choking hazards, such as in small pieces that might be ingested; to strangling or tangling hazards (long shoelaces come to mind). A favorite item used by owners is the cardboard tubing from bathroom tissue or paper towels. Many parrots love to shred these. Beware, though, the cardboard contains chemicals and sadly, there have been reports of smaller parrots becoming stuck inside these rolls and drowning in nearby water dishes. When offering homemade toys to your parrot, supervision is the order of the day, and unless you are 100% certain that any homemade toy does not pose potential hazards, it might be an idea to remove the toy before leaving your bird for extended periods. 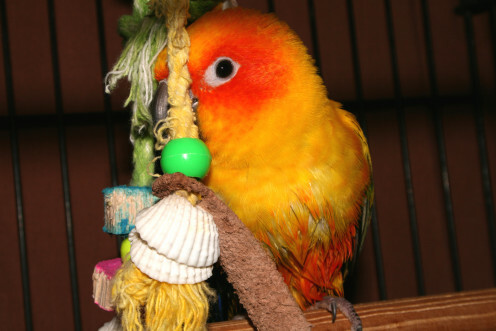 What Are Your Favorite Parrot Toys? Toys should be rotated and new parrot toys offered to keep beaks busy and curious temperaments satisfied. 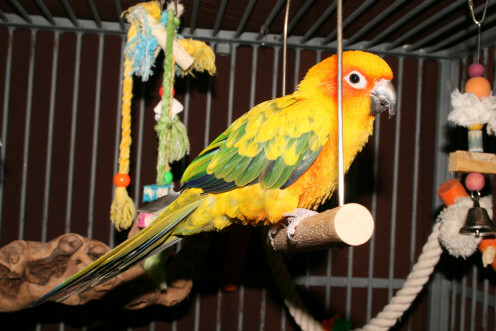 As can be seen from this overview of the different types of parrot toys, avian playthings are far more than just brightly-colored objects to compliment a cage. Parrot toys provide an outlet for curiosity, playfulness, stimulation, chewing and faux building activity, they facilitate wing flapping and bodily exercise, and even provide companionship. It is not enough to show your love for your parrot by giving it nutritious food and an ample cage. Providing for physical needs is only part of the picture.To have a truly happy, well-adjusted parrot, providing for its emotional and mental needs is also critically important. Parrots are incredibly intelligent creatures and a bored and frustrated bird will soon become a problem bird. Providing a variety of colorful, engaging toys is a wise investment and will pay off over the long-term. We have a family member who has a parrot that's been passed down through generations. This is good information, and a great article! I like parrots, but I didn't know that they really need toys. Very interesting information, thank you for sharing knowledge about it. Hi Heidi, I'll be adding pictures to this hub as I develop it. Just like dogs who need toys! If you ever make a video of your parrot playing with his toys, add it to the hub. We'd love to see it.